I read loads of Agatha Christie novels as a teenager but, until last year, hadn’t picked up one of her books in more than twenty years. However, a chance to participate in a blog tour for Agatha Christie week last year prompted me to re acquaint myself with Death on the Nile in audio format. Since then I’ve listened to two more Christie stories narrated by David Suchet (who plays Poirot in the most recent BBC tele movies) and one narrated by Hugh Fraser (who plays Hastings in the same series). So I thought I should complete the experience and try one narrated by Joan Hickson (who played Miss Marple in her own series of tele movies). 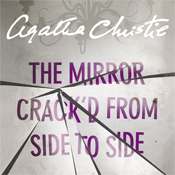 This book (published as just The Mirror Crack’d in the US) returns to what seems to be a theme for Agatha Christie as it features an actress as a key character. Here actress Marina Gregg has taken up residence at Gossington Hall near St Mary Mead, home of the inquisitive Miss Marple. Gregg and her husband, who is a film director, host a fête for a charitable cause and during the event a select group of people is chosen to meet the movie star. One of these visitors, Heather Badcock, dies soon after meeting Gregg and recounting the story of their previous meeting a dozen or so years earlier when Badcock rose from her sick bed to meet the star and get her autograph. When it is revealed Badcock was poisoned it is assumed that Gregg was the real intended victim and Badcock died by accident. Published in 1962 this is one of Christie’s later novels and does address quite well the social changes that are taking place in rural England at the time. There is a new housing development on the outskirts of St Mary Mead which is changing the place’s character and contributing to Miss Marple’s sense that she’s losing touch with things. Miss Marple is also more elderly than ever. She even has to submit to the indignity of a full-time live-in companion; a very annoying woman who treats Miss Marple like she is a stupid child. I think Christie has done a really terrific job of capturing the frustration experienced by someone who is aging but is in full command of their mental faculties even if their physical abilities aren’t what they used to be. However the plot here is not one of Christie’s best. The first half of the book labours several points too often, including the actress’ nervous state and the link to the book’s title (it’s a line from a Tennyson poem called the Lady of Shalott which must have been repeated at least a half-dozen times). There is one too many amazing coincidences revealed at the end. One of these is believable (in fact the book is based on something that happened to actress Gene Tierney but don’t google it unless you don’t mind spoilers) but the second is overkill (and totally unnecessary as it adds nothing to the story whatsoever). I also found the depiction of the policeman called in to investigate the crime to be quite unrealistic (although he’s very sweet to Miss Marple). To be honest I’ve always preferred Hercule Poirot over Miss Marple so my reaction to this book is not that surprising. While Poirot is far too clever to be real and would undoubtedly be an insufferable chap to spend any time with at least he is depicted with faults whereas Jane Marple has always struck me as impossibly perfect. And the Poirot plots are the more puzzling, clue-based ones that fit with my preference for logic whereas those featuring Miss Marple tend to be based more on what seem to me to be rather wild and random assumptions about human nature. Also, sadly, I did not enjoy Hickson’s narration. She seemed to swallow her words and fade away as if she was turning from the microphone and I had to rewind several times to catch what she was saying and she really didn’t seem to be paying that much attention to what she was saying. So if you are going to track down this book I wouldn’t recommend this particular audio version. 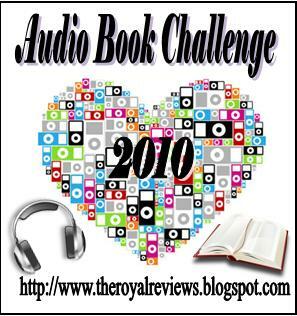 This entry was posted in Agatha Christie, Audio Book Challenge 2010, book review, England. Bookmark the permalink. I wonder how old she was when she laid this down? My husband had neither read the book previously nor seen the movie from (I believe) the late 1970s/early 1980s (it has Liz Taylor, Rock Hudson, Kim Novak, etc. ), but when he started reading the book he was only about halfway through when he stated what he thought the solution was–and he was absolutely right. I agree, Christie really did lay down some rather heavy-handed clues in this one. Right now my husband is listening to Hugh Fraser reading Peril at End House while one of our chldren is listening to David Suchet reading Death on the Nile–so I’ve got Christie going in stereo at the moment! Bernadette – Thanks for this review. Like you, I’ve always preferred Poirot to Miss Marple, despite his insufferability. I know what you mean, too, about the narration. If it’s not done well, that can take so much a way from one’s enjoyment of a novel. I read a lot of contemporary murder / mystery, but had only read one Agatha Christie book about 18 years ago or something! I don’t even remember which one it was!